Newborns are prone to startled shocks during their sleep. Our experienced elders will always make a special "Ya Jing Pillow" with beans or rice for the babies. Real life experience and usage has proven that it can effectively aid babies to sleep better. Bumble Bee hence determines to continue the great cultural heritage with our innovated Baby Organic Pillow. Size : 5.5" x 13.5"
Place the baby organic pillow gently and horizontally over the baby's chest or tummy, comforting him with sense of security for a good sleep, so mums will be able to rest well too. Sun the pillow regularly for hygienic purpose. 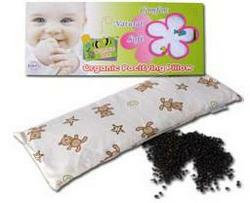 This will help to ensure that the pillow is free from odors caused by baby's saliva, milk or urine. The pillow case should be replaced and washed regularly too.